I cant help myself, I love polka dots. Especially different sized dots. Friday's top I have had for ever and love it. I didn't have any beige polish. Should I be ashamed to say that? I have about ten shades of pale pink, white and grey but no beige. I had to improvise but in person, it looked like a perfect match. I think you know what I will be doing today......buying some beige polish!!! I love this, I was actually thinking about doing this for my outfit for mamas day!! I am a dot fiend. Love this! Do you have real honest to goodness dotting tools or do you McGuyver it with the head of a pin like me? OMG. You have to buy a set of dotting tools. 5 bucks on Amazon for a set of five with all different sizes. Love them. You will too. 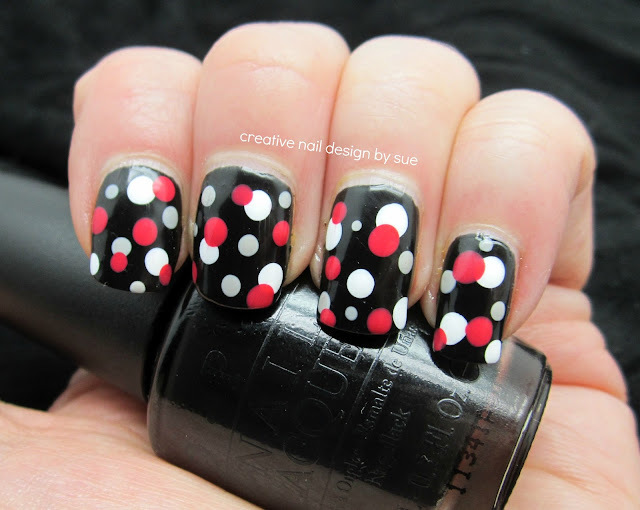 I love the color contrast and polka dots are very cute! I love that the dots overlap! So cute!